2009 has proved to be a tremendously busy and successful year with Qioptiq enjoying considerable growth, leaving the organisation well poised to enter 2010 on a firm footing and extremely focussed on the year ahead. As you will no doubt have read in previous issues, Qioptiq has firmly established itself as an international player in the worldwide electro-optics market, particularly in the area of sighting systems for the dismounted close combat user, with the VIPIR2 family of Thermal Weapon & Surveillance sights steadily growing and gaining interest around the world. Qioptiq has also established itself in the area of Total Contractor Logistics Support (TCLS) and is now in the fourth year of working in partnership with the UK MoD Dismounted Soldier Systems (DSS) Project Team in Abbeywood, delivering the valuable support of the UK’s dismounted night vision equipment via the CASE contract; an extremely important service that ensures that availability of the in service equipment is kept at high levels to support ongoing operations. In order to support the ongoing CASE contract, Qioptiq has just unveiled a new purpose built facility at its St Asaph site creating a centre of excellence for Land Equipment. Since the last edition (June 2009), a number of significant developments have taken place within Qioptiq. During DSEi this last September, the UK Minister for Defence Equipment & Support (Quentin Davies, announced the award of the £150m prime contract to Thales UK for the delivery and in–service support of a surveillance and target acquisition (STA) system, which forms the first increment of the UK MoD’s Future Integrated Soldier Technology (FIST) programme. 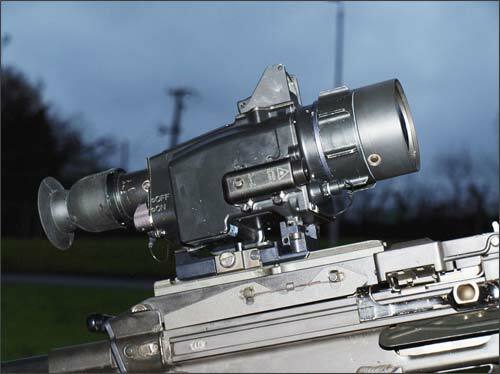 Qioptiq are responsible for delivering a number of elements of this important programme, including a new Thermal Weapon Sight and upgrades to existing Night Vision Weapon Sights. The FIST Thermal Sight (FTS) is a high performance un-cooled Thermal Weapon Sight that provides the User with 24hr target detection, acquisition & engagement capabilities out to extended ranges. The FTS is equipped with a 640x480 format un-cooled thermal core, and is powered from AA batteries. Tailored specifically to meet the FIST requirements, the FTS provides enhanced MMI, an integrated Infra Red Laser Aimer (IRLA) for enhanced target identification, along with an integrated Close Quarter Battlesight (CQB) red dot sight (supplied by Shield in the UK) in order to provide the User with a rapid target engagement capability for close range engagements under all light conditions. The FTS offers a number of key STA elements in an integrated package and represents world leading capability in a compact, lightweight package. The FTS brings together technologies and capability from around the world, including detector technology from FLIR in the USA and Laser Technology provided by ILEE in Switzerland. This is a shining example of the approach taken by Qioptiq to ensure that the appropriate technologies and components can be closely integrated to reduce weight and power. The FTS also has the ability to be controlled remotely via the weapon hand guard, again demonstrating an enhancement in the wider integration context. Qioptiq will deliver over 4,000 FTS between 2010 and 2014. Qioptiq have also been contracted to provide enhancements to the current in-service fleet of Common Weapon Sights (CWS) and MAXIKITE2 units, which will include the addition of the red dot CQB sight provided by SHIELD in the UK. Qioptiq will convert over 4,000 in service CWS & Maxikite2 Night Vision sights throughout the same 2010– 2014 period. 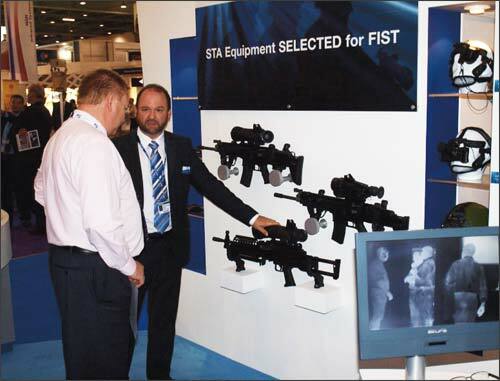 The award to Qioptiq following extensive field trials and independent assessment process clearly establishes the equipment as best in class, and clearly takes benefit from the company’s experience in soldier modernisation, and thermal weapon sights in particular, where Qioptiq has over 14 years experience under its belt. The mix of new equipment and upgrades to existing legacy equipment demonstrates how the Incremental approach of the FIST project team can be used to good effect in improving the overall STA capability of the FIST equipped section. We can expect a number of new developments from Qioptiq during 2010, and the company is planning to launch a new range of products at the Soldier Technology Global exhibition being held in London during May. Having learnt a great deal during the past 6 years since the TIDI (Thermal Imager Dismounted Infantry) Technology Demonstration Project, and the launch / entry into service of the VIPIR2 fleet, which provided invaluable operational feedback; technology developments and manufacturing process developments means that we can now move forward to deliver greater capability in lighter, smaller packages. A new family of un-cooled Thermal weapon sights are currently under development and will be available in a number of different variants, ranging from short to long range applications, with a number of specialist and multi–role variants thrown in the mix to complete the family. With ITAR free variants being available, the new family is set to compliment the VIPIR2 series over the coming years, therefore ensuring a smooth capability transition for existing customers. The approach adopted with the new family is three fold. Firstly, we looked at the challenge of designing the smallest, lightest most versatile thermal sight we could, and went through an extremely rigorous trade off process in order to arrive at the result is a Thermal Weapon Sight weighing less than 500g that provides detection out to ranges in excess of 500m. Secondly, we looked at reducing the size, weight and power of the existing VIPIR2 systems whilst not sacrificing the current range performance. This approach is well aligned to the current requirements of a number of nations who have deployed enhanced capability and are now looking to reduce the burden/lighten the load without too much compromise. The result is a weight reduction of approximately 25-30 percent over current VIPIR2 equivalent variants. Finally, we looked at enhancing the range performance of our existing long range systems, without adding extra weight. The end result is actually providing enhanced range performance for an overall reduced weight and more compact package. This will provide extended DRI (Detect, Recognise, Identify) capability that will allow longer range support systems such as 0.5” HMG and 40mm AGLS to be used out to their maximum effective ranges without having to rely on cooled thermal cameras to deliver the longer range sighting capability. Un-Cooled systems are better suited (providing they can provide the required range performance) due to their lighter weight, higher reliability and lower cost. The longer range system will provide detection of human targets at ranges in excess of 3km, in a package weighing less than 1.4Kg. The resultant of this multi pronged development approach is a range of Thermal Weapon Sight variants built upon a common architecture and greatly improved Man Machine Interface (MMI), therefore greatly reducing the training and supportability requirements. As always, the ability to provide world class equipment free from ITAR restrictions has played a key role in the decision making through out the trade off process. Also, recognising the continuing trend for high performance, light weight, clip on in-line image intensified night vision adaptors for the assault rifle / marksman / sniper applications, the new in line Image Intensifier family will also be launched at Soldier Technology Global. With roots firmly based in the KITE & SNIPERKITE equipment, Qioptiq has taken a fresh look at the approach of the in–line clip on sight in order to provide a light weight & compact solutions without compromising on image quality. Qioptiq has also significantly strengthened its Research & Development activity in order to ensure that the novel approaches, concepts and technologies can be exploited and transitioned through the Technology Readiness Levels efficiently in order to deliver deployable solutions in a timely manner. The development of a new family of Thermal Weapon Sights is an example of this, and we expect more to come throughout the year. The requirement for sensor fusion, a true 24hr sighting solution still stands firm in the eyes of Users around the world, and we are steering closer to this becoming a reality as the enabling technologies become more compact and lighter weight. Qioptiq will be exhibiting at the UK MoD’s Defence Research 2010 Annual Conference & Exhibition (being held 23&24th March at the Birmingham International Conference Centre) where they will be looking forward to discussing research, technology and development requirements and opportunities. Qioptiq, along with our customers and industry partners are totally committed to reducing the weight and burden of our ultimate customers – the end users of our nations that are tasked with undertaking dangerous operations in harsh environments. Hopefully as you have read through this short article you have captured the spirit of what we are about - that is providing the best we can within the realistic constraints of technology and availability.